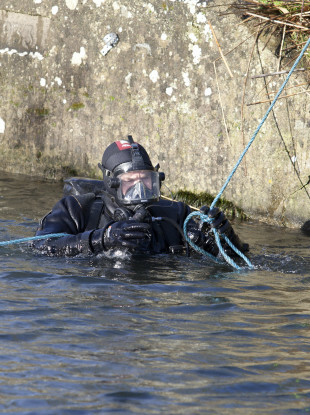 Search teams looked for Kenneth O'Brien's body parts in the Grand Canal outside Sallins in County Kildare in 2015. A WOMAN WHOSE partner’s dismembered body was found in a canal has given evidence of collapsing after his killer told her the deceased was having an affair when she told him he was missing. Eimear Dunne also told the Central Criminal Court about a break-up text sent from somebody purporting to be her partner just hours earlier. She was giving evidence this morning in the trial of Paul Wells Sr, of Barnamore Park, Finglas, who is charged with murdering Kenneth O’Brien at the accused man’s home. Wells (50) has admitted shooting the father-of-one dead and dismembering his body. However, he has pleaded not guilty to murdering the 33-year-old on 15 or 16 January 2016. He told gardaí that the deceased had wanted him to murder Dunne. Dunne testified that she and their son had kissed the deceased goodbye that morning before she dropped the little boy to her mother’s home before going to work. O’Brien reminded her that he would be home late that night due to work. She told Gillane they had exchanged text messages throughout the morning, mainly concerning the cold, icy conditions, with O’Brien enquiring as to whether she had got to work okay. Dunne had still heard nothing by the time she went to bed that night, but received a text message from an unknown number at 3.30am. I’m heading for the ferry today. I can’t handle being home and I want out. You care more about Zac and your family. I met someone else and she came to Ireland yesterday. I met her today. I’m going with her. There’s no point in talking. All I’d get anyway is a row. The sender wrote that she would hear from him when he was sorted to organise things with their son and his “gear”. “I’ve had to spoof everyone to do this but this girl will put it right. I’ll be in touch,” it concluded. “Then, I was looking at the text message and I was saying: ‘That’s not right’,” she explained. “Zach is spelt wrong. ZAC is not how you spell it. There’s no full stops,” she continued. There’s no capital letter for Ireland. That’s not Ken. Ken is very particular about his text messages. ‘Gear’ is not a word Ken would use and ‘spoof’ is definitely not a word Kenneth O’Brien would use. Dunne began calling family members and O’Brien’s friends, including the accused. She said he explained that the deceased had met someone in Australia, where he had been working until Christmas. He said he had been seeing her for a good while before he came home and that he hadn’t wanted to return home. “I think I collapsed on the floor,” she said. The accused told her he’d be over in a few minutes. The trial continues before Mr Justice Paul McDermott and a jury of six women and six men. Email “Woman whose partner's body was found in canal 'collapsed when she heard about alleged affair'”. Feedback on “Woman whose partner's body was found in canal 'collapsed when she heard about alleged affair'”.